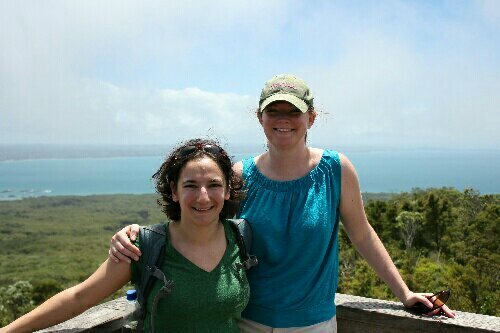 Rebecca and I atop Rangitoto. Hello again, Danielle here. We just spent days one and two in Auckland, whose Maori name roughly translates to City of Many Lovers. Fun fact, brought to you by Lonely Planet (honestly, what would we do without LP). We really enjoyed our stay here, and though we didn’t see a ton of lovers (at least not openly displaying it), we did climb many, many hills, or at least the same hill 6 times from the supermarket to our hotel. Branding is fun to experience, particularly when done well. And I will admit, I was pretty sucked into the Aloha mentality by the successful expression of the Hawaiian Airlines brand. As soon as you walk onto a Hawaiian Airlines plane, you are greeted by the relaxing, transporting sounds of native birds, the ukulele, and the Pacific Ocean. It’s almost as if you have already arrived. Forget that you were just felt up by a 300-pound security agent, or that someone got on the moving walkway to just stand there while you were racing to your flight. The flight attendants greet you with, “Aloha!” and “Mahalo.” You’re welcome, Hawaiian Airlines attendant; you’re welcome. Danielle here. I am writing this entry from San Francisco International Airport, at the beginning of our voyage around the world. Our flight to Honolulu boards in 30 minutes, and then from there it’s on to Auckland. Rebecca and I have everything we need for our trip now, so we are all ready to go!